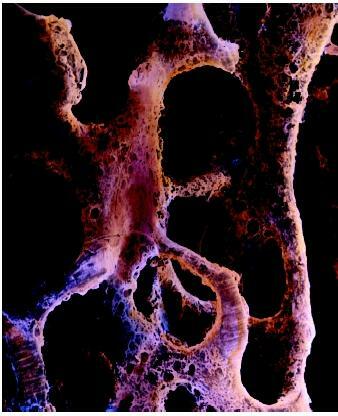 A false-color scanning electron micrograph of cancellous bone tissue affected by osteoporosis. future bone. Once their own extracellular matrix traps the osteoblasts, they become fully mature osteocytes. Brilliant! As a layman, I was stunned by the well-choreographed sequence of specialised cells doing their part of the construction job, and solving all the engineering problems gravity and stress imposes.